Attractive appearance, all necessary functions, all-in-one design, high performance, long run-down time and... low price are far not all the advantages of the new mobile PC TravelMate of the 270 series! - this is how this model is positioned by the company. Acer's notebooks always had a pleasing design, but the price.. Let's see how it is achieved. 256MB DDR-266 SDRAM. Expandable up to 1024MB (the tested sample has 256 MB). Ultra ATA/100 hard drive, 20GB (the tested model has Toshiba MK2018GAP 20 GB). So, compared to the TravelMate 630XC, the dimensions are almost the same though it has become weightier. As you can see, the company decided to save on a smart card connector, so typical of the previous models, and on an IR port. Also, it uses integrated graphics and doesn't allow replacing the optical disc drive. Recovery packet on 4 CDs - bootable disc with drivers for Windows XP, User Manual and Help, and 3 recovery packs for Windows HP Professional (in different languages). There are no LEDs on the back panel either. So, to check whether the battery is full you must open the lid and look into the slit between the lid and casing (sometimes it's possible to read the values of the LEDs :). In the front we have a floppy drive instead of the "fired" IR port, but I think it's more convenient when a diskette is inserted on the side. The speakers are on their previous place. The left panel is not abundant in connectors. 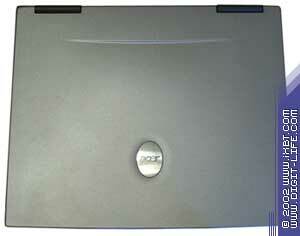 Here we have only the optical drive which is located closer to the back panel. I wish the floppy drive were here as well, but there is a hard drive located in front. PS/2 connector in the center of the air vent. Now the booting process is not so intriguing any more as nobody asks for a smart card :). The LEDS are grouped in two places - above the keyboard on the right are LEDs for the locks, and below, to the touchpad's right are status LEDs (power, input/output, battery and wireless network) which can be seen only through the slit. In my opinion, the previous solutions were better. By the way, a wireless network is mentioned neither in the specs nor in the system devices. But there is the respective button and LED. And when you press the button the LED goes on. Note that neither Bluetooth nor 802.11b devices were able to connect to the TravelMate. 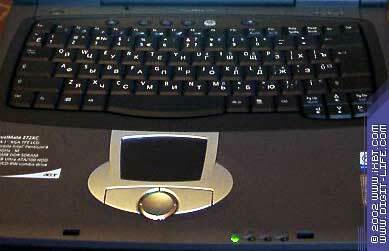 The keyboard is traditionally curved, and instant keys are on their own places. The touchpad has a similar shape though the design is a little bit different. There is no more a DASP protection fitted to the base (that's one more thing they are saving on), but there is a fan of the processor's cooling system. 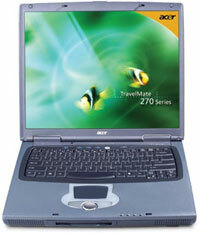 The Recovery features were fully described in the review on the Acer TravelMate 630 - and it's all the same here. Well, I didn't feel any difference in operation. But there are two complains about the computer, and they concerns the indication units (the lower one is covered by the hand at that) and the floppy drive's location. Lack of an IR port is not a downside for a business model. Warranty. Acer notebooks have a one year warranty. And starting from November a user can buy one more year of warranty for a mobile computer (not valid for batteries). In case of the TravelMate 270 it equals $80 by retail (fixed price). Service. 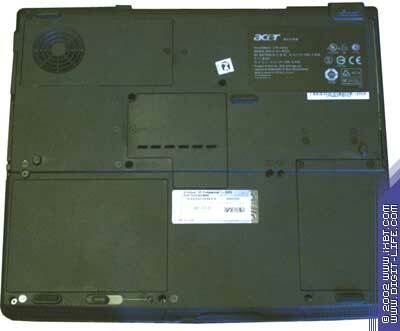 Today any authorized service center (the list of them is available on the site) can carry out diagnostics of the notebook and repairs in certain cases. But in the end a computer will anyway get into the central service center, if the warranty period is not over. If it's over, a notebook can be repaired on the spot. Site. The site is quite unsophisticated, descriptions of notebooks are detailed, illustrated and have a demo program. There is a base of drivers and BIOS updates. The hot-line support was checked in the review of TravelMate350. In short, it works. During the warranty period any upgrade can be done only in the authorized service center. After that you can add memory yourself (by unscrewing the lid on the bottom) and replace the hard drive (by removing two screws and taking out the HDD unit). The processor should be replaced by professionals from the service center, though you can also do it yourself (as you can see it on the photo). "-1" - design of the LED units. The TravelMate 272XC will certainly be compared with the TravelMate 630XC. The video memory of the 272XC will be set to 32 MB. Well, the more powerful processor (1.6 against 1.4 MHz) shows higher scores even with the integrated graphics system. I just don't understand clearly why the Ziff-Davis Disk WinMarks tests have so different results on the same disc, but it can be caused by the different chipsets. Let's see whether the new-comer is still stronger in the MadOnion 3DMark 2001. The scores of the TravelMate 630XC are given in parentheses. Well, lack of the hardware support of Transform&Lighting can't be made up for by two hundreds of megahertz. However, it's not a gaming solution but a business model where 3D is not supposed to be outstanding. Our mark is 97 scores. Well, it's now clear what they have saved on. Now let's see what they managed to reach. The recommended retail price for the model with a 15" matrix is $1870, for the model with DVD it makes $1770 and the tested sample is around $100 cheaper. Taking into account that the TravelMate 630XC in not on the sale anymore and the recommended retail price for the TravelMate 634LC lying on the shelves is $2300, you can calculate the difference yourself. I think that it overlaps minor disadvantages if a smart card reader is not crucial for you. 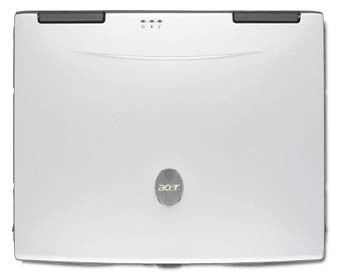 However, I'm not pleased with current prices for Acer's notebooks contrary to their desktop computers.